Of course, what we’re really talking about is the Rugby Union Autumn Internationals, taking place over this month of November 2017! With the New Zealand All Blacks thrashing the Barbarians at Twickenham Stadium in front of a 62,000 strong crowd last Saturday, and the mighty England next in the line up to play at Twickers this Saturday against Argentina, we thought it would be a good time to take a look at the history of the home of England Rugby and one of the most iconic sporting stadiums: Twickenham. Whilst looking at the history of the stadium, we came across the top 5 things you probably didn’t know! This stadium was not always the destination of rugby lovers far and wide. In fact, the land was originally used to grow cabbages, hence the stadium affectionately being known as the Cabbage Patch! The land was purchased in 1907 for a measly £5,500, with the first stands constructed early 1908. The first game, between Harlequins v. Richmond, was played on 2 October 1909, and the first international, England v. Wales, on 15 January 1910 – At the time of the English-Welsh game, the stadium had a maximum capacity of 20,000 spectators; it can now hold 82,000 rugby fans, becoming the 2nd largest stadium in the U.K. Since its opening, the stadium has of course hosted 1000s of rugby matches. It has also hosted the Rugby World Cup Matches in 1991, 1999 and 2015 with England as hosts in 1991 and 2015. Interestingly enough, in all of the stadium’s history, 23rd October 2016 was the first ever time another sporting event has been played: The NFL. 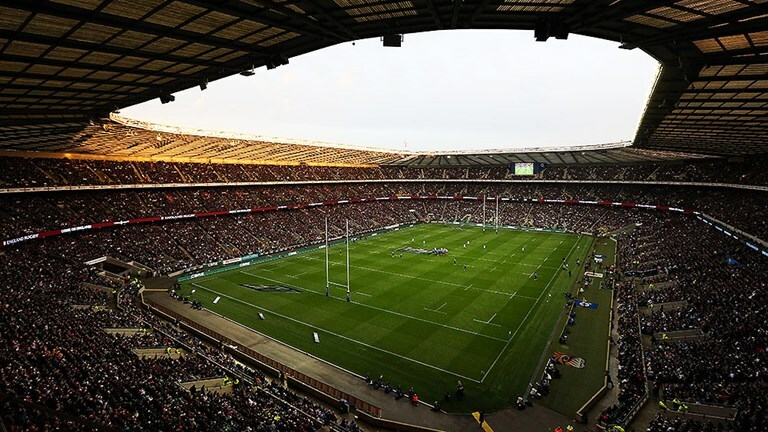 It seems like Twickenham Stadium has always been a place for firsts, not least when it comes to technology. It was here in 1927 that England vs. Wales was broadcast live on the radio for the very first time! Fast forward 11 years to 1938 and an innovation was being trialled at Twickenham Stadium that in time would have a profound bearing on the game of rugby. The 52nd Calcutta Cup would be played out in front of cameras that would broadcast the game live on television for the very first time. March 19, 1938 – a day that would go down in Rugby history forever. Wanting to keep up the tradition of staying ahead of the times, Twickenham was the first stadium in Europe to have unlimited Wi-Fi. (You’ve got to keep the millennials happy somehow…). Not only an iconic sporting ground, Twickenham is also home to the World Rugby Museum; attracting visitors near and far. Opening in 1996, the museum is located in the East Stand of Twickenham Stadium. (It officially became the World Rugby Museum in 2007). The cellar is the stadiums, ‘most exclusive dining facility concealed deep within the prestigious West Stand. It seats up to 14 people for an intimate and unforgettable dining experience, with a champagne and canapé reception, seven course tasting menu accompanied by fine wine and tea, coffee and homemade truffles’. Not only a great stadium to watch unforgettable rugby, but seemingly a place that holds a lot of history close to its rugby-ball shaped heart. If you are looking to arrange a day out to this stadium, and need experts to look after your travel plans, contact us here for your no obligation free quote.